We had a standing room only turnout for our first 2019 Fridays in February speaker series last week. CYC member Chris Young gave a great talk about the highs and lows of his trip around Vancouver Island. His "Raven Recommends" were especially good tips. It's a testament to the strength of CYC, where members can enjoy and learn from the travels of other members. Events like the February series wouldn't be possible without the members who volunteer their time to make it happen. Thanks to all the members who helped make the first talk a success: Laurie Bushue for all the prep work involved, Molly Cain and Kaley Walgren for preparing and serving the food, Laurie McRae for tending bar, and everyone else that pitched in Friday night: Ron and Peggy Watt, Chris McMuldroch, Joyce Phillips, Mike McGuane, Hans Reinhardt, and Paul Baker. Fifty sailors braved the cold last weekend and were rewarded with beautiful weather and two great days of racing. Many thanks to our race committee and whaler drivers: PRO Geoff Pease, Catherine Picha, Brad Greene, Matt Wood, Sara Longley, whaler driver Calvin Schnorbus and whaler driver Dylan Edlund. Suzette Connolly, CYC Boat Show Lead. A full clubhouse filled with an enthusiastic crowd celebrated sailors of all stripes (Racing/Cruising/Juniors) who experienced memorable sailing adventures in 2018. With the bartenders keeping up with the demand – the stage was set for a fun-filled CYC Awards Party on Friday, January 18 celebrating a multitude of outstanding 2018 performances. 2019 Commodore Jakob Lichtenberg hosted the ceremony assisted by several other Officers and Board members. The Awards came quickly, but not before Commodore Lichtenberg emphasized that the true winners for the Discretionary Awards were the nominees, itself a true honor to be celebrated. Hans Otto Giese for outstanding service – the Club had three outstanding nominees for the Club’s most prestigious award, each with an outstanding record of service. For the first time ever, the Board elected co-winners: SHAUNA WALGREN and CATHERINE WEATBROOK. Shauna was recognized for her outstanding work in successfully running the junior sailing program in-house for the first time as well as her work on women’s sailing and the Club’s social programs. Catherine helped set up the Club’s office systems in 2017 and then worked tirelessly to ensure its operational success in 2018 as well as being a constant volunteer in Board activities, the office and behind the bar. The third deserving nominee was junior sailor OWEN TIMMS; in 2017 he personally organized the first Junior-Only Leukemia Cup raising over $10,000; he followed that up in 2018 with an even more successful event, raising over $16,500 -- all while having a very successful sailing year on a Laser Radial personally and other dinghies sailing for Olympia High School. Sailor of the Year – DALTON BERGAN, who successfully skippered and crewed on various boats in 2018, including numerous wins on his RS Aero, Loop, winning the Pacific Coast Championships in rhe Columbia Gorge (bullets in 12 of 13 races), Frigid Digit and PSSR, was 2nd in the International 14 Pacific Rim Championships (tied for first but lost the tiebreaker on the last leg of the last race), won the Shaw Island Classic and shared the win on Race to the Straits on Madrona and crewed on Riptide at Southern Straits, Swiftsure and Pacific Cup. The other nominee, 11 year old DIETER CREITZ, among other achievements, won almost every Optimist race in the Northwest, placed high in a number of national Optimist races, skippered a RS Feva, a 2 person dinghy, to a 2nd in class, 3rd overall (first USA boat), at the RS Feva Worlds in Florida, and skipered Three Ring Circus in podium places in Race to the Straits and Down the Sound. Boat of the Year – HERE & NOW, skippered by Pat Denney, with firsts at Blakely Rocks, Scatchet Head, PSSR, PSSC, the Fall Wednesday night series and Round-the-County, winner of the Northwest Challenge Cup for best combined performance at Center Sound, PSSR and PSSC, and seconds at Three Tree Point, Whidbey Island, Spring and Summer Wednesday nights and Sloop’s Blakely Rocks Benefit. Other nominees, each with many firsts and other top finishes throughout 2018: ABSOLUTELY, skippered by Charlie Macaulay, DELIRIUM, skippered by Jerry Diercks, LOOP, skippered by Dalton Bergan, and MORE JUBILEE, skippered by Erik Kristen. Gary Horder Award for outstanding Junior Sailor – DIETER CREITZ, who dominated Northwest Optimist sailing, winning the Northwest Youth Racing Circuit with 6 wins in 7 regattas, and was first overall at the USODA Northwest Regionals, the Pumpkin Bowl regatta, was first in fleet in the Canadian Optimist Championship and had top finishes in other national Optimist events. He addition he skippered a RS Feva, a two-person dinghy, to 2nd in class and 3rd overall (first USA boat) at the RS Feva Worlds in Florida, skippered Three Ring Circus to a first and third in the Race to the Straits and Down the Sound, respectively, and crewed on Smoke, Toxic and other big boats. Other nominees were 11 year-old JACOB POSNER, who was a close second in Northwest Youth Racing Circuit on Optimists and had top finishes in other Optimist events, and high school senior OWEN TIMMS who won the Northwest Youth Racing Circuit and had other top finishes on his Laser Radial in the Northwest and nationally and led his Olympia High School sailing team to top Northwest finishes. Boating Family of the Year – AL and JANE JOHNSON. The Johnsons successfully race and cruise their Quest 30 Charlotte and Al enjoys sailing Edgar, his foil Moth. On Charlotte they won the Gibson trophy, were 5th in class in Center Sound and 3rd in class in the SYC Tri-Island series. They are active in the CYC cruising program, often inviting others to participate in mid-week cruises, and each summer take month-long cruises in the San Juan and Gulf Islands. The second nominee, the LHAMON FAMILY (Haley, Rusty, Barrett and Taylor) had a very active 2018, including Haley being co-skipper and co-navigator on Sail Like A Girl, winner of the Race2Alaska, serving on the Sailing Foundation, Commodore of the Port Madison Yacht Club and youth sailing instructor for the Bainbridge Parks Department; Rusty sailing his Thistle on Lake Washington with family members, Barrett participating the NW Youth Racing Circuit and other races on a Laser Radial and Taylor, a University of Oregon freshman, participating in family cruises on Lyric, the family’s Alden 44. Cruising Boat of the Year – RAVEN, a Vagabond 47 Ketch, owned by Chris Young. Chris is an active member of the CYC cruising group. In the summer of 2018, he sailed beyond his normal sailing area with a circumnavigation of Vancouver Island – starting out with this 3 teenage daughters, and then a rotating group of friends as they explored places such as Chatterbox Falls, Hot Springs Cove and Tofino, and dealt with usual long-cruises crises such as running aground. Chris will speak about his circumnavigation at the February 2019 cruising talks. The other nominee, SOLSTICE owned by Ron and Peggy Watt, fulfilled the Watt’s long dream cruise of three and half-months heading north to Alaska and back; earlier in 2018 they sailed from San Francisco to Puerta Vallarta on Dragon’s Toy with Tom Khors and Cary Purvis. Dog House Award for an unseaman-like activity –ROBERT HODGE skippering his Catalina 30 Abendstern to an early return home start on an outgoing tide after a CYC cruise to Marrowstone Island, took a direct line out of Kilisut Harbor between the buoys, a no-no, and ran aground. And stayed there. All the 12 other boats on the cruise had the opportunity to sail by, wave and take photos, which they did! As Robert noted, he had just installed a new depth sounder, but it works best when the skipper looks at it! Six hours later they were able to resume their delayed trip home. The other Nominee (and happy non-winner): Staff Commodore JOHN RAHN for an upwind broach in heavy seass on Pickled Beets just before finishing the third and last race at Grand Prix, which found one crew through the lifelines hanging on to the shrouds and John flat on his back up to his neck in water in the cockpit. All this in full view of the Race Committee. Everyone was rescued, John regained the tiller, and Pickled Beets managed a tie for 2nd place in the race and a half-point win at Grand Prix. Also recognized by Matthew Woods, Fleet Captain Race, were the many volunteers and employees who contributed throughout the year to make the Club’s racing program a success, including Rachelle O’Haleck and Aryn O’Haleck in the office, Bartender Karen Sheide, PROs Charley Rathkopf, Troy Childs, Egor Klevak, Geoff Pease and Brian Watkins, and those many persons who served as Protest Judges (noting that Jared Hickman had just been named as an International Judge) ,whaler drivers, volunteer bartenders, volunteer race committee members, protest judges, webmasters, race registrars, regatta chairs and others. He also thanked Hans Spiller for engraving all the awards and trophies, Jan Anderson for contributing most of the photographs used in the Awards slideshow and the Boat of the Year photograph that hangs by the bar, and Ken Johnson for preparing information about nominees for the Board’s decisions and writing the script and collecting the 100+ photos for the evening’s presentation. All in all, a very successful evening filled with lots of sailing stories and memories (mostly true) of an outstanding 2018. Great fun for everyone there, and a good time was missed by those who weren’t. On Monday, January 14 the new board held its first meeting led by incoming Commodore Jakob Lichtenberg. Jakob started the meeting by outlining the new board's objectives as (1) Focusing on transitioning the new leaders to their roles (2) Continuing to strengthen the club's finances (3) Remaining focused on advancing our mission to serve our members through diverse programs and strengthening of the sailing community. As the club's new officers, we are humbled to be given the opportunity serve the club and build on its tremendous history and success. The depth of programs offered by the club and commitment of many dedicated volunteers make our club a great resource to the sailing community and the depth of our initial agenda and fact the meeting went a bit late into the evening indicates that 2019 is shaping up to be another exciting year for the club. A few notable highlights from our first meeting included the Treasurer's Report presented by Karen Mooney, where she walked us all through a preliminary 2019 budget and new plans for the food and beverage presented by Rich Bustamante. Additional topics included the Business Manager's report on operations, racing and cruising schedules, plans for the Junior program, efforts to build new business memberships, and a recruiting update for new members. On that last point, all three of us spent time on Saturday January 26th at the Boat Show helping to recruit new members, and We're happy to report we all had success! Many thanks to Suzette Connolly for taking on coordinating this important event for the club. Looking forward to seeing everyone at an event soon! The Corinthian Yacht Club of Seattle (CYC) was founded in January 1945 for the purpose of promoting, advancing and encouraging the sport of Corinthian (amateur) sailing, including racing and cruising, and strengthening the sailing community through the voluntary actions of its members. CYC’s 73rd Annual Membership Meeting was held on Thursday, November 14, 2018, and I would like to summarize it for you here. Prior to beginning the meeting, members enjoyed a hearty meal cooked by Chef Galen and beverages served by Karen. The meeting began by reviewing and approving the minutes from the 2017 Annual Membership Meeting, and reviewing election information and 2019 officer and director nominees. A motion was passed to close the voting period. We next reviewed the State of the Club, including membership and financial data. Numbers of CYC members and membership revenues have remained relatively consistent for the past few years, while operational costs have continued to rise. CYC’s membership dues have not increased since the club’s restart in 2011 (e.g., $35.00/mo for an adult family member aged 30-69), while costs (as measured by the Consumer Price Index) have increased over 12% during that period. Moorage, utility, and other costs at Shilshole Bay Marina have increased to a greater extent – and the Port of Seattle has recently announced another 7% moorage rate increase for 2019. It has become increasingly more difficult each year for our club to operate on the membership dues structure that was established in 2011. CYC has consistently lost money when serving food except in cases where a significant number of members have enjoyed the meal and contributed enough revenues to offset the food and labor costs, and changes were made in 2018 to address this. The club’s bank balance has declined the past few years, including a net loss of $35,084 last year, but we are forecasted to finish 2018 net positive only through extraordinary efforts of the board, food/beverage cutbacks, and unusually strong junior sailing program revenues this year due to volunteer efforts led by director, Shauna Walgren. For the reasons discussed above, the board has approved a 10% increase in membership dues for 2019 (e.g., $38.50/mo for an adult family member aged 30-69). The combination of this relatively small increase in revenue and good recent club investments, including CYC’s new Wild Apricot operational/membership management system, will provide a solid foundation for the future of our club. Following this operational summary, Fleet Captain Race, Matthew Wood, presented a summary of a strong 2018 CYC racing program, which included continued growth of the RC Aero, J/80, and J/105 fleets. CYC partnered with business member Sail Northwest (Bob Ross) to host a successful revival of J/Fest after a 7 year hiatus. CYC also hosted the USODA 2018 NW Opti Championships, which was the best ever attended regional event of this type. Weeknight racing on the lake continues to have a consistently good turnout, but weeknight racing on the sound appears to have declined in recent years – particularly for dinghies on Thursdays. This will be evaluated further in 2019 to ensure that CYC racers continue to enjoy excellent racing opportunities that meet their needs. 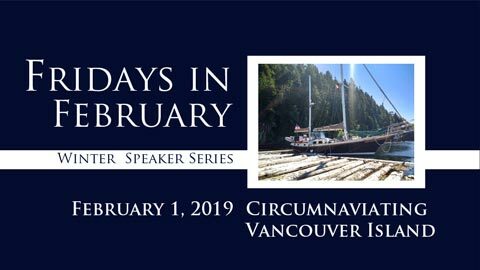 Fleet Captain Cruise, Mike McGuane, presented a 2018 CYC cruising summary which included a discussion of the perennial member favorite February speaker series and second Thursday cruising socials, and a summary of member cruise events that were held at an average rate of one or two cruises each month in 2018. Another good year of CYC cruising. CYC’s director leading junior sailing, Shauna Walgren, presented the successes of CYC’s junior sailing program in 2018, which included well attended sail camps that were taught by CYC sailing instructors along with CYC junior sailing assistants. These camps had both the highest number of students and the highest number of assistants (e.g., former students) of the current era of CYC junior sailing – with sailing in both Opti and Vanguard 15s (V15s). A private donor funded 15 scholarships that allowed some children to participate that otherwise may not have. The Wednesday night Guppy program for 4-7 yo kids and the Friday night open sailing program for kids of all ages both continued to be successful at getting more kids out on the water. CYC again hosted a Milfoil Dodger that allowed young racers to experience the thrill of racing around buoys – many for the first time. The high school racing program really made great strides in 2018. The high school racing team grew to include 15 members that won the 2018 NWISA North Regionals (as Ballard High School). A CYC junior sailing fundraiser held in February 2018 raised $9,000 that was used to purchase a trailer with four Flying Juniors (FJs) that were used to compete against other high school teams in the region. CYC’s director leading membership/social/educational events, Liz Rose, presented 2018 social/educational information including a summary of how members can make events happen with the support of CYC’s social/educational committee, chef, bar, and office staff. 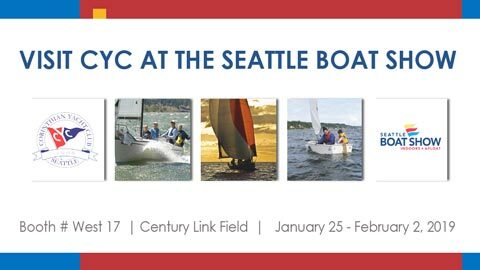 Liz also reviewed the large number and variety of events that were held in CYC’s clubhouse in 2018, as well as upcoming events including the CYC Annual Awards Party and Seattle Boat Show in January. After summarizing CYC program successes in 2018, Staff Commodore, Wayne Balsiger, then introduced the 2019 Heart of CYC Capital Campaign. Membership dues cover operational costs, but not costs for capital projects such as the much needed haul-out of the clubhouse, upgrades to the clubhouse interior/exterior, or CYC race equipment upgrades. As Wayne summarized in last week’s Telltale, CYC members have donated over $80,000 thus far – about half of the estimated $160,000 necessary for the clubhouse haul-out. Please donate as you are able to help CYC achieve this important goal. Our club and clubhouse are core regional sailing community assets, and achieving this goal will help us ensure that we can keep strengthening the sailing community for many years to come. CYC is truly an amazing club with a remarkable 73-year history of strengthening the sailing community, and it has been an honor and privilege to serve as CYC’s Commodore in its 73rd year. A hearty welcome to the 2019 board, and I am excited for what should be a terrific year for CYC in 2019! The 2018 racing season is coming to an end, and it is time to consider the 2018 CYC outstanding performers. The Board will select the Award winners who will be announced at the Awards Party to be held in January 2019. Or you can drop them off at the CYC Shilshole office. Ken assembles the nominations and presents them to the Board for its decisions. Hans Otto Giese Inspirational – one who has consistently provided leadership and inspiration to CYC and the amateur sailing community. Recent winners include Suzette Connolly, Jen Hobden, Geoff Pease and Michele Rogalin Henderson. Sailor of the Year – consistently races and places in the top tier of dinghy or keelboat races, including juniors; this award includes sailors who are outstanding crew or who sail on different boats throughout the season. Recent winners include Keith Whittemore (along with Brian Thomas, Kevin Downey, Shelby Milne and Mark Rodgers), Talia Toland, Carl Buchan and Fritz Lansinger. Boat of the Year – for an outstanding season in CYC and other NW races. Recent winners include Jubilee (Erik Kristen), Last Tango (Jim Geros), Tremendous Slouch (Scott Milne) and Ranger (Pat Schnirmer). Boating Family – an active family in racing, cruising, CYC activities, other sailing efforts. Recent winners include the the Cains, Sandersons, Buchans and Walgrens. Greig Memorial Cruising – cruising leadership and accomplishments, whether in local or blue waters. Recent winners include Scott and Kristen Meilicke, Jon and Michelle Henderson, Rich Jablonski and Elaine Cashar, and Ron and Peggy Watt. Gary Horder Memorial – CYC Junior with active and successful racing program. Recent winners include Abbie Carlson, Dieter Creitz, Talia Toland and Owen Timms. George Spalding Inspirational – most inspirational Junior sailor. Recent winners include Owen Timms, Jack Holbrook, Blake Bentzen and Abbie Carlson. Dog House – a sailor who handicaps him/her self by unseamanlike activity – usually some bad luck and hopefully with a bit of humor in it. 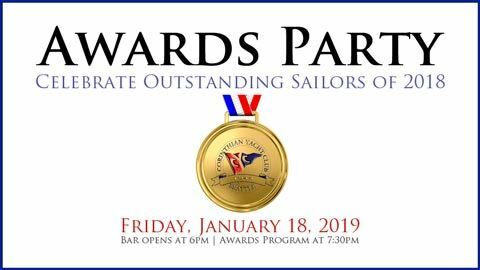 Recent awardees include David Gallimore (stepping off YC6 and taking 2 steps, with only 1 step worth of dock), Mike McGuane (purposely going aground in Fisherman’s Bay followed by denial), and Lee Youngblood & Kathleen Davis (not achnoring on a Blakely Rocks cruise). Continuing Officers and Directors: Current Commodore Paul Kalina becomes Junior Staff Commodore in 2019, and Shauna Walgren continues on serving the second year of her 2018-2019 term. A big THANK YOU to CYC for hosting the 2018 USODA Optimist NW Championship this last weekend! 48 youth sailors between the ages of 8 and 15 from USA East Coast/West Coast, and Canada East Coast/West Coast competed in the 2-day regatta. CYC’s excellent race committee held 3 races on Saturday and 4 on Sunday. 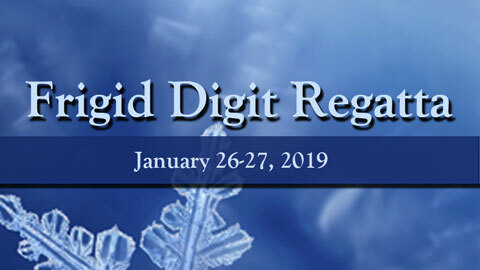 A special thank you to the regatta chair Erin Timms, and to Matt Wood, Charley Rathkopf and his entire race committee, the on the water judges, the CYC Office, Karen, and all CYC staff, and all volunteers who made this event run so smoothly - many hands made for light work. The list of the top 25% sailors that qualified at this event for the 2019 USODA Team Trials to be held in the spring at Californian Yacht Club can be viewed here. First and second place went to CYC’s very own sailors Dieter Creitz and Jacob Posner! Congratulations!